Wells Gray Provincial Park is home to some of the best waterfalls in British Columbia, Canada. The large wilderness park has 39 named waterfalls, many of them in remote areas, but the rest of them are easily accessible. Wells Gray is a world-class destination for hiking, rafting or fishing. Wells Gray Provincial Park caught us by surprise. We did not intend to visit this park on our Canadian road trip, to be honest, we did not even know it existed. When we were planning our travel itinerary, we tried to fit all must-see attractions into couple weeks and unfortunately didn't have time to explore less known places and of the beaten paths. How lucky we were that we came across the land of waterfalls. We were on our way from Whistler to Jasper National Park, and as we were driving for a few hours already, we stopped in Clearwater to have quick lunch. We pulled over near information center (just at the junction of Yellowhead Highway) and only out of curiosity went inside to have a look what's in the area. 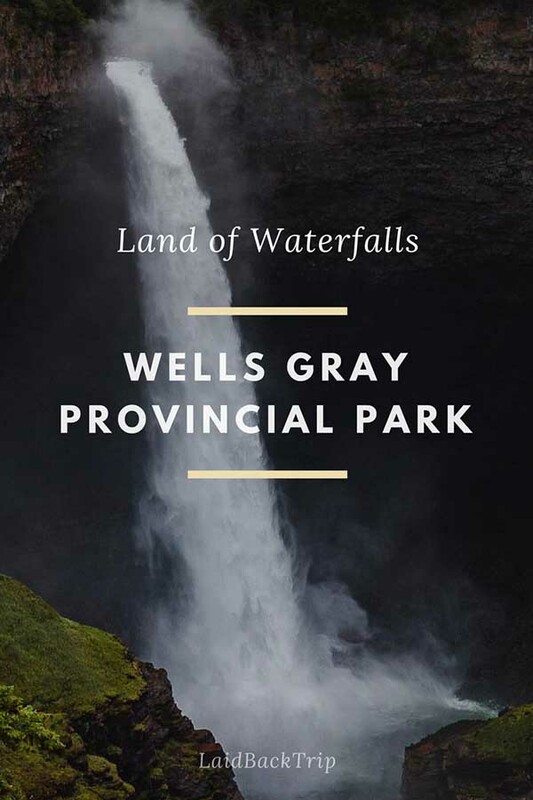 We quickly found out that Wells Gray Provincial Park is Canadian land of waterfalls (there are 39 named waterfalls in this park!) and made a spontaneous decision to take a detour and visit the nearest and most spectacular ones along the road. The best advantage of waterfalls we visited, except for their beauty, is the proximity to the road. You can easily walk from the parking lot and take a short boardwalk to the viewpoints. Three waterfalls we chose, are about 50 km from Clearwater and this detour took us only about 2.5 hours. Wells Gray Provincial Park is huge and when you don't intend to spend a night in the park and visit more remote areas, the best way, how to explore it is to follow Wells Gray Corridor. Everything in the corridor is easily accessed off the Clearwater Valley Road near Clearwater. The very photogenic falls drop 80 meters down from Spahats Creek into Clearwater river. Falls cascade from a keyhole in a rock face and the rock formations which surround the waterfall were created by numerous volcanic eruptions approximately 300 000 years ago, and it took another 100 000 years for Clearwater River to begin cutting its shape to the lava. During Pleistocene magma was scraped away by icefields and when the ice finally melted, the floods carved the canyon. Spahats Creek Falls is the first stop along Clearwater Valley Road, only 10 km from the visitor center. Turn left off from the main road and then walk 250 meters to the viewing platform. Spahats is a term for bear in the First Nation Language and for some time, Spahat Falls was known as Bear Creek Falls, but because there are so many Bear Creeks in British Colombia (almost as many as bears in BC), to avoid confusion, it was decided to use the Aboriginal name as the official one. Helmcken Falls is probably the most iconic waterfall in the Wells Gray Provincial Park. Its high is 141 m which makes it the fourth largest waterfall in Canada. The importance of Helmcken Falls can be documented by the fact, that the whole park was created just to protect it. We visited this falls in late summer, but in case you are traveling in winter time, don't hesitate to stop here. We've found amazing pictures of the frozen 141 m cone of water, which must be quite impressive to see with very own eyes. To get to Helmcken Falls, turn left off the main road 42 km from the visitor center. You get to the side road and just follow it as it ends at the parking lot area. Dawson Falls is only a few kilometers before Helmcken Falls, but its appearance is completely different. To get to a viewing platform, you must take an easy trail, via a forested walk, and about 10 minutes you'll reach the falls. Dawson Falls is sometimes nicknamed as Little Niagara Falls. It is 90 meters wide, 20 meters high and the loud roar of running down water is deafening.